In 2011 seals were showing up on some Arctic Ocean beaches with some unusual symptoms; some were dead or dying. The US federal agencies issued warnings to consumers of marine mammals in the region and began an intensive investigation of the cause (see http://alaskafisheries.noaa.gov/protectedresources/seals/ice/diseased/ume_qa0612.pdf). What US government researchers have suspected as resulting from chemical contamination such as persistent organic pollutants, radionuclides or disease may be nothing more than severe sunburn. Figure 1. This seal shows the hair loss typical of this event. Few cases of sick seal were reported in 2012. However, since the spring of 2012, scientists have documented 23 polar bears from Alaska with hair loss, skin and mouth sores. Tests for toxicity, thyroid function, vitamin A and trace minerals in polar bears have been inconclusive (see http://alaskafisheries.noaa.gov/protectedresources/seals/ice/diseased/ume_update0213.pdf). The symptoms expressed by the seals and polar bears was preceded by the lowest ever recorded ozone concentrations in the Arctic stratosphere during March 2011 and elevated ultraviolet (UV) levels throughout the Arctic and sub-Arctic (Bernhard, et al. 2012a). Manney et al. (2011) described the event as unusual because the Arctic stratosphere is normally too mild for ozone depletion to progress like the Antarctic winter. But in the winter of 2010-2011, extreme cold in the upper atmosphere lasted more than a month longer than any previous Arctic winter, and the temperatures were low enough to generate ozone-depleting forms of chlorine a month longer than normal. There are reports of other marine mammals suffering from UV exposure. Martinez-Levasseur et al. (2010) identified high UV levels causing sunburns on whales. They concluded that the thinning ozone layer may pose a risk to the health of whales and other vulnerable wildlife, and found that several species of whales and dolphins had skin lesions they say are due to exposure to increased UV exposure. Betsy Weatherhead, University of Colorado CIRES / NOAA, reports in her paper, UV radiation: the unexplored threat to the Arctic, (http://www.arctic.noaa.gov/essay_weatherhead.html) to have also observed the consequences of low ozone and high UV levels in the Arctic. Weatherhead reports that humans are at greater risk from the increased UV and many organisms, including phytoplankton and zooplankton, the basis of the marine food web, may be affected, and these are important food for many commercially important species. The increased UV levels seen in 2011 and unusual stratospheric conditions, ironically, may be linked to global warming (Manney et al. 2011). Austin et al. (1992) and Shindell et al. (1998) predicted increased Arctic ozone depletion resulting from increases in atmospheric CO² levels due to stratospheric cooling. Increases in water vapor, a result of global warming, may also result in ozone depletion (Kirk-Davidoff et al. 1999). Rex et al. (2006) data indicates a steady trend for colder stratospheric Arctic winters, increased stratospheric cloud formation and greater ozone depletion supporting the link of climate change, ozone depletion and increased UV levels in the Arctic. The evidence suggests a link of the 2011 ‘unexplained mortality event’ of Arctic seals with low ozone levels and high UV levels. 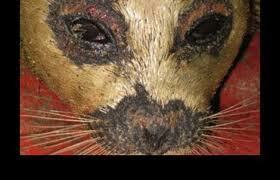 Some of the symptoms of the seals are consistent with radiation burns and consistent with reports of other marine mammals becoming sunburned (Martinez-Levasseur et al. 2010) and, the symptoms are consistent with those predicted by Weatherhead. But, the internal damage to the seals, including lesions on liver, brain and heart, is not necessarily only from UV exposure (van der Leun and de Gruijl. 1993). Until more research describes specific consequences to wildlife from UV overexposure and excludes those symptoms seen in 2011, predictions for increased ozone depletion and increases in UV don’t bode well for Arctic life. Controlled laboratory experiments using test and control seals exposed to UV may provide additional evidence to support or reject the hypothesis presented here. However, we may find it best, if not more humane, to test this hypothesis by waiting and preparing for the Arctic to experience another ozone depletion event (see http://environmentalaska.us/ultraviolet-radiation-uv.html). Austin, J., Butchart, N. & Shine, K. P. Possibility of an Arctic ozone hole in a doubled-CO2climate. 1992. Nature 360, 221–225. Manney, G. L., et al.. 2011. Unprecedented Arctic ozone loss in 2011 echoed the Antarctic ozone hole, Nature, 478, 469-475. Available at: http://www.nature.com/nature/journal/v478/n7370/full/nature10556.html. Martinez-Levasseur, L.M., D. Gendron, R. J. Knell, E. A. O'Toole, M. Singh, and K. Acevedo-Whitehouse. 2010. Acute sun damage and photoprotective responses in whales. Proc R Soc B 2010 : rspb.2010.1903v1-rspb20101903. NOAA Fisheries. 2013. Northern Pinniped Unusual Mortality Event (UME) Update. Shindell, D. T., Rind, D. and Lonergan, P. 1998. Increased polar stratospheric ozone losses and delayed eventual recovery owing to increasing greenhouse-gas concentrations. Nature 392, 589–592.